Draper • A career wildland firefighter from Draper died Monday while battling the massive Mendocino Complex Fire in California. Draper Battalion Chief Matthew Burchett, 42, suffered injuries after a tree fell on him, The Press Democrat in Santa Rosa, Calif., reported. He later died at Ukiah Valley Medical Center. The newspaper reported three firefighters from Kings County, Calif., were injured. Burchett was near Lake Pillsbury combating the Ranch Fire — one of multiple blazes making up the larger complex. His survivors include a wife and 6-year-old son. (Courtesy Draper Fire Department via Facebook ) Firefighter Matt Burchett, seen here in this undated photo, died Aug. 13, 2018, combating wildfires in California. “The entire community of Draper is mourning his loss,” said Mayor Troy Walker. House Speaker Greg Hughes, whose district includes Draper, said the mayor is close to the family. Walker helped get Burchett’s wife to her husband’s body and is helping to bring it back to Utah. Flags at Draper City Hall were quickly lowered to half-staff; the city fire department added a black band across its shield online. California Gov. Jerry Brown ordered flags lowered in that state to honor Burchett. Sean Kavanaugh, an incident commander for the complex, said at a brief news conference that a Utah firefighter was working “an active portion” of the Ranch Fire. Burchett posted photos of him and other firefighters battling flames on Instagram early Monday. 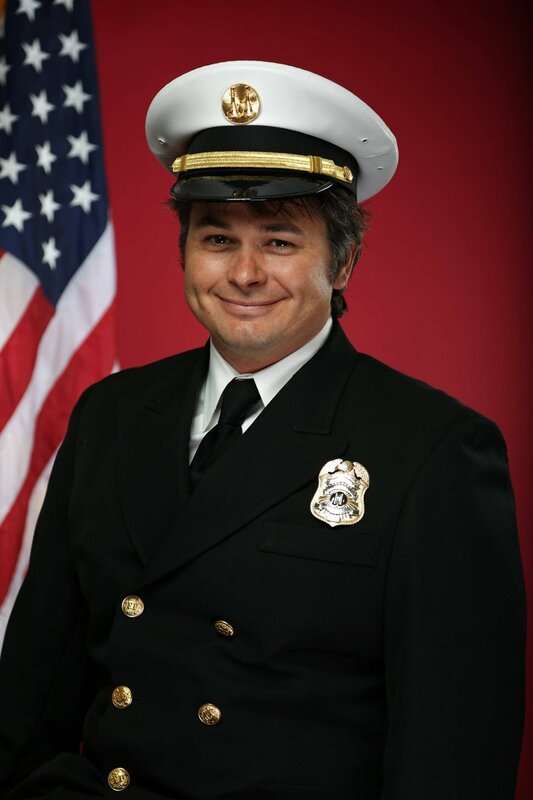 Cliff Burningham, president of International Association Fire Fighters Local 1696, the union representing firefighters in Salt Lake County, said Burchett had been a mentor to him. Draper Fire Battalion Chief Bart Vawdrey said Burchett “jumped at the chance to assist in California.” Burchett was one of about 40 Utah firefighters, from seven agencies, deployed in a state facing the most intense wildfires in the nation. Burchett had years of experience with wildfires. He graduated from Judge Memorial High School in 1994, then began working as a seasonal firefighter with UFA’s wildland division in 1995. (Rick Egan | The Salt Lake Tribune) Firefighters attend a news conference at Draper City Hall in memory of Matt Burchett, 42, who died fighting wildfires in California. Tuesday, Aug. 14, 2018. He eventually became a full-time firefighter with UFA and reached the rank of captain. While he responded to the same house fires and medical emergencies every city firefighter does, he also continued battling wildfires. He traveled to blazes in California in 2009 and 2016. Watson called Burchett an “expert” at wildland firefighting. He was aggressive but not one who took undue risks. “The most common comment I’ve gotten from people who called is, ‘He’s the guy who always kept me safe,’” Watson said. Burchett is believed to be the first Utah firefighter to die battling a wildfire since 2006. That year, U.S. Forest Service firefighter Spencer Koyle, 33, died in what was then called the Devil’s Den Fire east of Oak City. In 2009, three members of a private firefighting company from Missoula, Mont., died in an airplane crash near Stockton, Utah. Last year, contractor Bryan Burr died on the burn scar of the Brian Head Fire when he was hit by mulch falling from a helicopter. Live: Draper City is holding a press conference regarding Battalion Chief Matt Burchett, who died battling the Mendocino Complex Fire in California. The Mendocino Complex Fire — comprising the River Fire and the Ranch Fire — is the largest recorded blaze in California history. It has burned about 550 square miles and destroyed nearly 150 homes in Mendocino, Lake and Colusa counties. Burchett is the sixth firefighter killed battling wildfires in the Golden State this summer. The Utahn was one of five Draper firefighters recently deployed to California. The surviving firefighters from Draper will be returning to Utah shortly, the mayor said. Californians reached out to Draper on Facebook to express their condolences and gratitude for Burchett and the other Utah firefighters. “As a Mendocino County resident with children, grandchildren, other friends and relatives affected by the Mendocino Complex Fire in multiple counties I can’t thank you enough for sending your firefighters here to help us,” posted Alice Langton-Sloan. (Danny La | Tribune file photo) In this 2003 file photo, crew boss Matt Burchett weighs his equipment as Utah firefighters prepare to go to Texas to assist in the search for debris from the Space Shuttle Columbia. Burchett died on Aug. 13, 2018, while fighting wildfires in California. Lightning ignited the Ranch Fire on July 24, according to a federal wildfire website. Information about funeral plans is pending. A donation site for Burchett’s has been set up by the Utah Firefighter’s Emerald Society at www.utahfes.org. Reporter Nate Carlisle contributed to this article.